The evening of Monday, 18 September 2017–and well into the morning hours of the next day –was an experience that will be remembered by all who lived through Hurricane Maria, a category 5 storm that brought havoc and utter devastation to this tiny island nation. As the valedictorian of St. Mary’s Academy that year so aptly said, “Life as we knew it, is no more.” One year later, recovery and rebuilding is still going on –and will continue for some time. But, thanks to the donors of the Christian Brothers Hurricane Relief Fund, some of that recovery and rebuilding was made possible. The sum of $214,000 EC ($104,000 CD; $80,000 US) was donated and dispensed from December through June of 2018. The St. Mary’s Academy, the Alpha Centre, the Brothers’ Community, several other church institutions and dozens of families were helped with aid to rebuild and to recover. The availability of these funds did not, however, speed things along. Soaring prices, congestion and confusion at the port, a shortage of building supplies and lack of workers added to the emergencies and frustrations. Windows, parts of the roof, appliances, gutters, pipe work, electrical and plumbing were all repaired in the Brothers’ house for a total of $11,600 EC. ($5500 CD; $4370 US). The community residence, though, suffered very little compared to tens of thousands of other residences and commercial buildings. Some estimates indicated that over 29,000 structures island-wide sustained significant damage. The Alpha Centre, a school that serves the handicapped, is directed by Brother Raymond Philogene. It suffered tremendous damage to both the outside and inside of its buildings. After it reopened in early December, plans to repair and rebuild began. A little over $74,000 EC ($37,000 CD; $27,700 US) was given to the Centre to assist in its recovery projects. St. Mary’s Academy sustained minimal damage compared to many other schools. 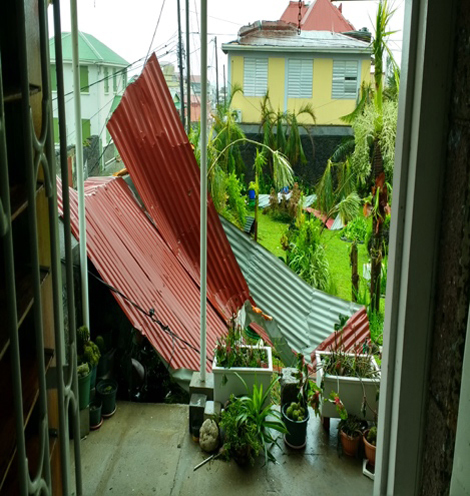 A little bit of the roof of one wing, some classes lost ceiling panels, the small structure housing one classroom, the sports room, the canteen and the brother’s laundry room lost its roof and thus internal damage was done. The music room and the school’s computer room lost just about everything. A significant amount of the donated funds was used to provide a food program for about five dozen students whose families were economically impacted from the storm. About $12,000 EC ($6,000 CD; $4,500 US) went to this project. Much of the remaining funds given to SMA -$57,000 EC -was used for repairs, clean-up and replacement of school equipment and supplies ($28,500 CD; $21,000 US). As time went on, many families began facing lost wages and employment. As a result, some of the money was used to assist families in tuition assistance ($3,400 EC; $1,700 CD; $1,200 US). Below, left, is the view of the area off the Brother’s kitchen that contains its laundry room and the building for the sports room, canteen and classroom. It was out of this area that the food program was housed (below right). Several teachers volunteered their time to shop, cook and distribute lunches. As time went on, it was evident that many families in some of the outlying villages needed assistance in order to repair their homes. So, the Brothers were able, thanks to the generosity of the benefactors to the relief fund, to provide over $32,000 EC ($16,000 CD; $12,100 US) for families in Tareau, Mahaut, Soufriere, Scotts Head and surrounding areas. Roofing and building supplies, bedding and furniture, clothing, school supplies and food were purchased to assist dozens of families. In addition, the following institutions were assisted: St. Mary’s Primary School in Roseau; St. Luke’s Primary School in the hard-hit village of Pointe Michel; St. Patrick’s Parish – which saw its roof collapse - in Grand Bay; and CALLS, a school for dropouts in the city of Portsmouth – the Brothers ministered there for a number of years. The $22,500 EC ($11,200 CD; $8,400 US) was able to assist these schools and parishes in their rebuilding efforts and/or to assist families. 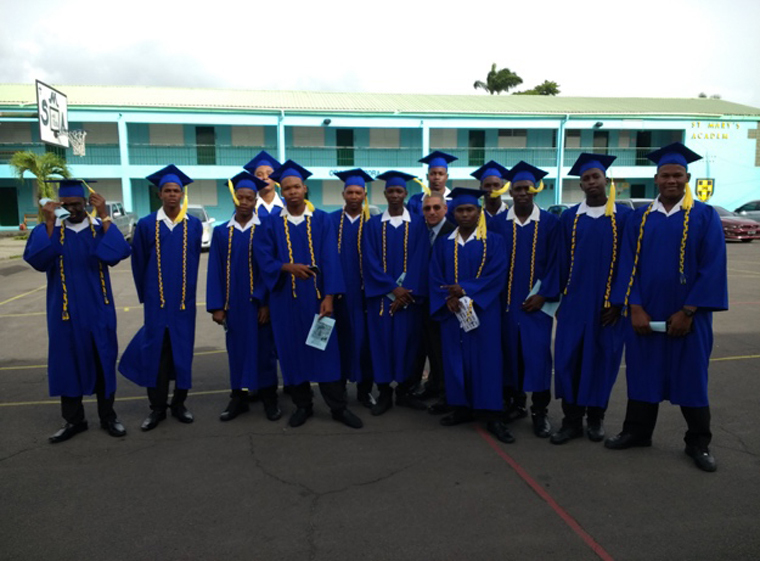 While most schools began to re-open four weeks after the storm –mainly to accommodate the older students to ready them for CSEC exams – it wasn’t until well into January of 2018 that schools around the island were fully in operation. By the end of October, St. Mary’s Academy was in full operation. In December, the Alpha Centre fully returned to classes. Both of these schools, though, saw a number of students absent from rolls due to overseas migration. Lack of internet service hampered many students as they moved forward in their education. St. Mary’s Academy, as did many other schools, became used extensively after school and on the weekends as centers of work to accommodate. One year later, the extensive damage done by Hurricane Maria is still evident island-wide; much has yet be done. While power has been restored throughout much of the country, many are still without power because to the -6-inability to adequately repair homes. Many rural mountainous villages are still in need of supplies, repairs and resources to do so. So, on behalf of the people who have been beneficiaries –directly and indirectly –of the generosity of the North American Province of the Edmund Rice Christian Brothers and our benefactors, Brother Raymond Philogene and I would like to extend our heartfelt thanks and gratitude. Please, keep us and the people of Dominica in your prayers as recovery and rebuilding continue. And, be assured of ours.